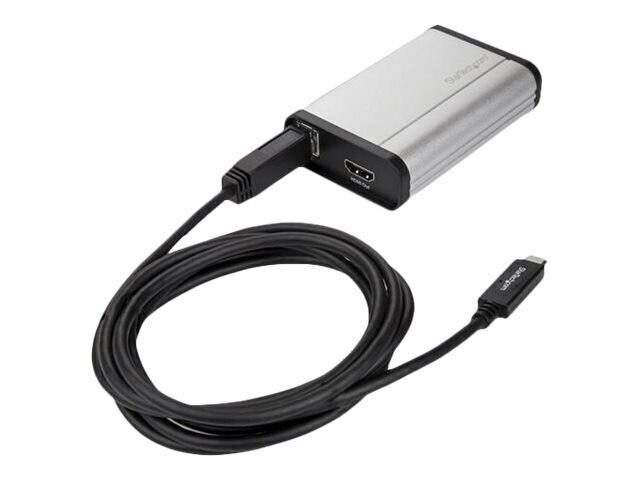 This HDMI to USB-C video capture device records high-definition HDMI video to your USB-C, USB-A or Thunderbolt 3 computer. With an aluminum enclosure, this device is built strong for fixed-location or on-the-go capture. It offers a separate 3.5 mm audio input for accompanying audio or voice-overs, and a HDMI pass-through port for connecting a monitor to review the video as it’s captured. The included software makes recording easy. Using a widely adopted codec, videos saved in StreamCatcher work with almost any video player and require no converting or editing. On Windows, you can live broadcast your video over the internet, using Twitch or other third-party video streaming platforms, with the included software. With this capture device, you’re not tied to the included software. You can record raw/lossless video using any third-party DirectShow compatible software, such as Open Broadcaster Software (OBS). This video capture device requires a USB 3.0 port (or higher). The video capture device does not work with USB 2.0 ports (or lower).